Crypto price action has been pretty slow lately, so I’m zooming in to the shorter-term time frames to scout for any directional clues for bitcoin and its buddies. 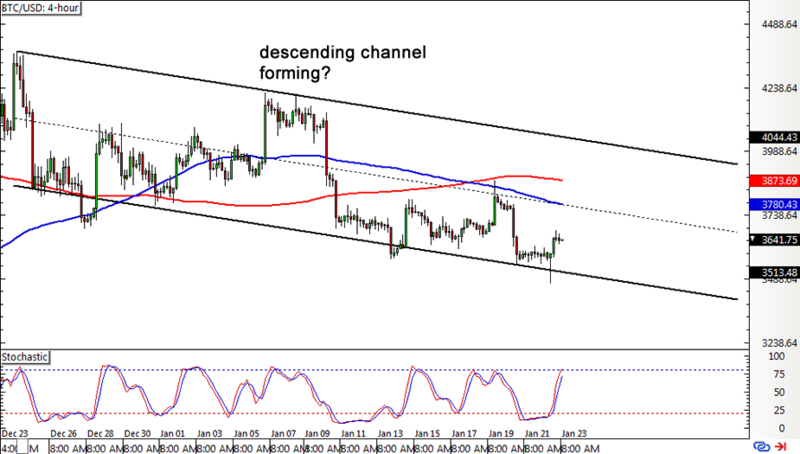 Bitcoin is still in selloff mode as price recently formed lower highs and lower lows to cruise inside a descending channel on the 4-hour chart. Price is still hovering close to support and a bounce could take it up to the top near the $4,000 handle or until the mid-channel area of interest. Sellers might be waiting around this level since it’s also blocked by the 100 SMA dynamic inflection point. Also, the 100 SMA is below the 200 SMA to signal that support is more likely to break than to hold. Stochastic has a bit of room to go before indicating overbought conditions. 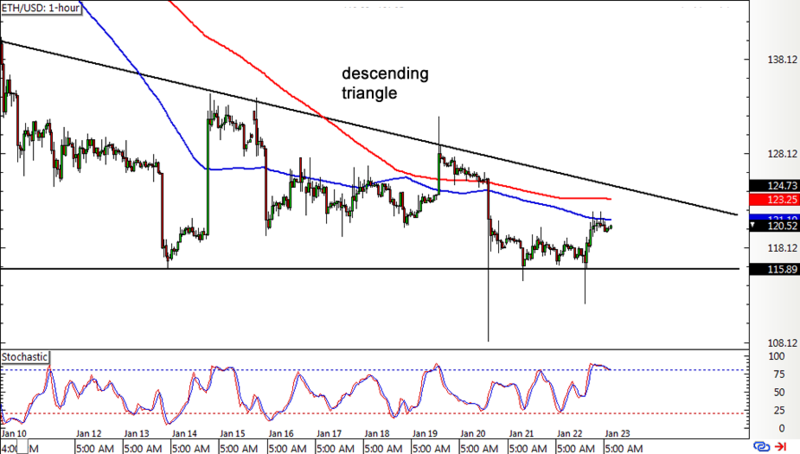 Ethereum might be taking a brief pause from its downtrend highlighted last week as price is consolidating inside a descending triangle pattern on the 1-hour time frame. Support is holding so far, which means that a bounce back to the top might be due. The moving averages might also provide near-term road blocks, especially since the 100 SMA is below the longer-term 200 SMA to confirm that resistance is more likely to hold than break. At the same time, stochastic is already indicating overbought conditions or that buyers are feeling exhausted. Ethereum could follow suit as this oscillator heads south to reflect the return of selling pressure. Litecoin is pacing back and forth inside a range with support at $30.750 and resistance at $33.650. Price is at the middle of the range, still deciding whether to carry on with its move to the top or to fall back down to the bottom. Stochastic is in the overbought region and starting to head south, which means that sellers are ready to take control. The 100 SMA is also below the 200 SMA to reflect bearish pressure, although the moving averages are also oscillating to indicate consolidation. XRP is also in consolidation mode as it tests support and might be setting its sights back on the range resistance. 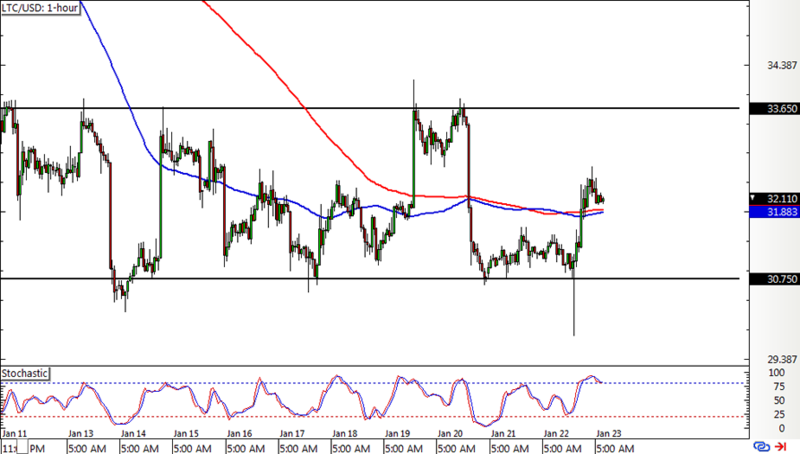 However, technical indicators are hinting that buyers could find difficulty taking price any higher from here. 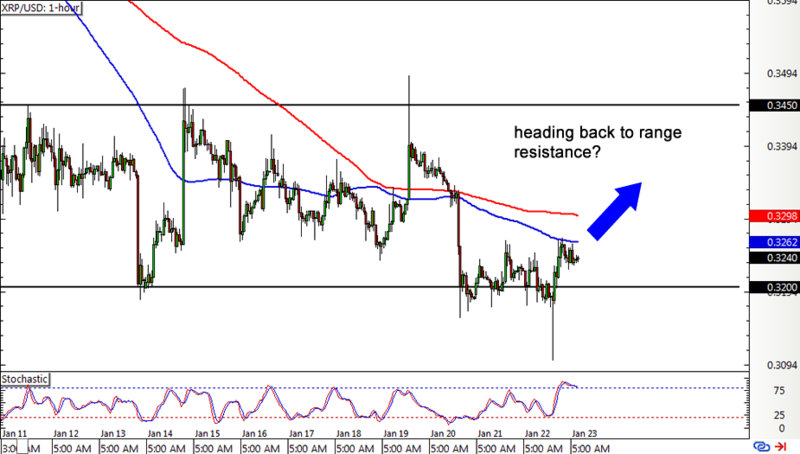 For one, the 100 SMA is below the 200 SMA and is currently holding as dynamic resistance. In addition, stochastic is in the overbought region to show that buyers are willing to let sellers take over from here. A break below the range bottom could spur a drop that’s the same size as the rectangle, so make sure you keep a close eye on this level!